As of Friday the 20th, San Francisco was still on fire. The Great Earthquake had happened two days earlier, but the Fire (or fires) that devastated the city were still well underway. The eastern quarter of the city — nearly five square miles — would be almost completely destroyed. But after the smoke cleared, a few precious blocks would emerged unscathed. Among these survivors would be the two blocks bounded by Montgomery, Jackson, Battery and Washington Streets. Oceans of ink have been spilled in documenting the incredible individual heroism and unfathomable professional incompetence displayed in fighting those fires. One of the best books on the subject is “The Great Earthquake and Firestorms of 1906” by Philip Fradkin, from which I’ve swiped much of today’s timecapsule. This is the story of a single building, but one of vital importance to the delicate Western palette: AP Hotaling & Co.â€™s warehouse at 451 Jackson Street — the largest depository of whiskey on the West Coast. 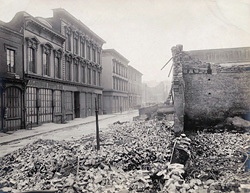 Hotaling’s warehouse was threatened on the very first day of the fires, Wednesday, April 18th. This particular blaze was one of the many inspired by rampant and ill-advised dynamiting, in this case by an allegedly drunken John Bermingham, not coincidentally the president of the California Powder Works. Encouraged by the blast, the fire roared towards the whiskey-packed warehouse. Its cornices began to smoulder, but a quick-acting fireman bravely clambered to the top and hacked them off. This was Hotaling’s first escape. "Welcome Back!!! Ah, how absence makes the heart grow fonder. Didnâ€™t quite realize how much I missed your brilliant story-telling though, until I couldnâ€™t stop smiling while listening to the newest episode!"